Central Mennonite Church -- Early frame building. The Central Mennonite Church (former Central Amish Mennonite Church), 21703 SR 2, Archbold, Fulton County, Ohio, is a member of Mennonite Church USA. The first settlers of this congregation came from Upper Alsace in 1834. Two related groups formed the congregation. Those in Fulton County were chiefly German-speaking and those across the line in Williams County in what is now the Lockport neighborhood spoke French. The congregation was organized in 1834-1835, and the first ministers were Christian Beck and Christian Rupp. Like most Amish congregations, they met in the homes of members until 1869, when the Central Church was built north of Archbold. With the growth of the congregation additional meetinghouses became necessary. In 1908 the congregation built the West Clinton Church in West Clinton Township east of Pettisville and the Lockport Church in Williams County north of Stryker. During the latter part of the 19th century and the beginning of the 20th the families of Deacon (later ordained Bishop) Eli Frey and Deacon Jacob C. Frey occupied a leading role in the history of the congregation. Eli Frey was the first lay Sunday-school superintendent. After its first organization about 1871, the leaders yielded to violent opposition and closed the school for a number of years. First superintendents were preachers Jeptha Wise and Jacob Nafziger, but it was encouraged by Bishop Christian Stuckey and several other ministers. Even after the Lockport and West Clinton churches had been built, the members worshiping at the three churches continued as one congregational organization. Beginning in 1908 each, however, had its own Sunday-school organization. 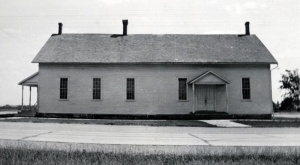 The Lockport and West Clinton churches were remodeled in 1930 and 1935 respectively to provide classrooms for the younger Sunday-school classes. The congregation built several additions to the Central Church which had been built in 1869 and dedicated in 1870. The old building was replaced by a large brick structure in 1936. By the mid-1950s the congregation had become one of the most aggressive in mission and Sunday-school work of any congregation in the conference. Members of the congregation preferred to be known as Amish Mennonites rather than Mennonites. The groups which met at Central, Lockport, and West Clinton were later organized as individual congregations. Several other congregations were also organized—Bancroft near Toledo, Tedrow near Wauseon, and Pine Grove south of Stryker. The membership of Central in 1952 was 765; in 2004 it 432. The Central Church suffered two schisms: (1) the Church of God in Christ, Mennonite (Holdeman) group in 1863, whose church is located in Pettisville, and (2) the Evangelical Mennonite (Egly-Defenseless) group in 1870, whose churches are in Archbold (1870) and Wauseon (1945). Grieser, Orland R. Out of the wilderness: history of the Central Mennonite Church, 1835-1960. Grand Rapids : Dean-Hicks, 1960. Umble, John S. "Central Mennonite Church (Archbold, Ohio, USA)." Global Anabaptist Mennonite Encyclopedia Online. 1953. Web. 19 Apr 2019. http://gameo.org/index.php?title=Central_Mennonite_Church_(Archbold,_Ohio,_USA)&oldid=161079. Umble, John S. (1953). Central Mennonite Church (Archbold, Ohio, USA). Global Anabaptist Mennonite Encyclopedia Online. Retrieved 19 April 2019, from http://gameo.org/index.php?title=Central_Mennonite_Church_(Archbold,_Ohio,_USA)&oldid=161079. Adapted by permission of Herald Press, Harrisonburg, Virginia, from Mennonite Encyclopedia, Vol. 1, p. 540. All rights reserved.